Decorated nails are a must for the spring summer season 2018, but it turns out that they are perhaps a good choice for our upcoming Halloween costume. It will help our costume look more real and scary. 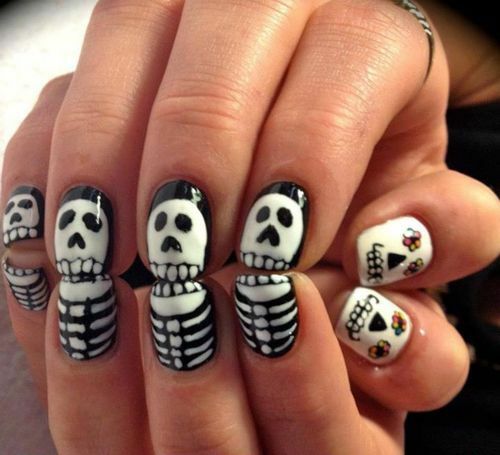 Maybe we can take advantage of that terrifying night and decorate our nails with drawings and motifs that can be related to our costume. In modaellas.com we want you to always look on point with the latest trends. 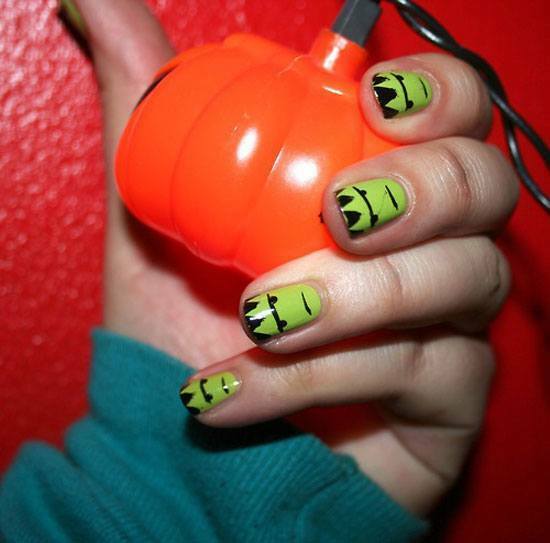 Now we would like to give you some ideas now on how to decorate your nails for the most terrifying party of the year . 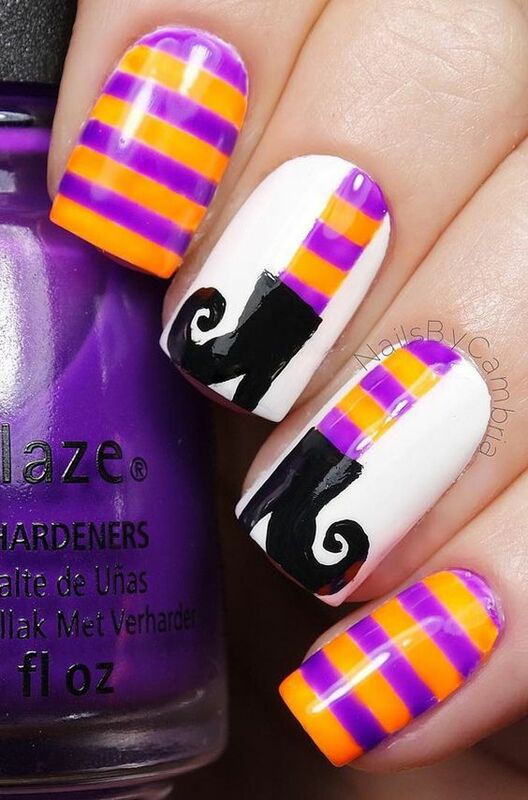 2 Halloween nails 2018: Easy peasy! For any event in which we want to surprise, it is fundamental that we devote some time to our image, not only to the clothes that we are going to put on or, in this case, the costume we’ve chosen. Nevertheless, we should also think about the perfect makeup to characterize ourselves, as well as the ideal nail decoration in order to come up with a spectacular look. 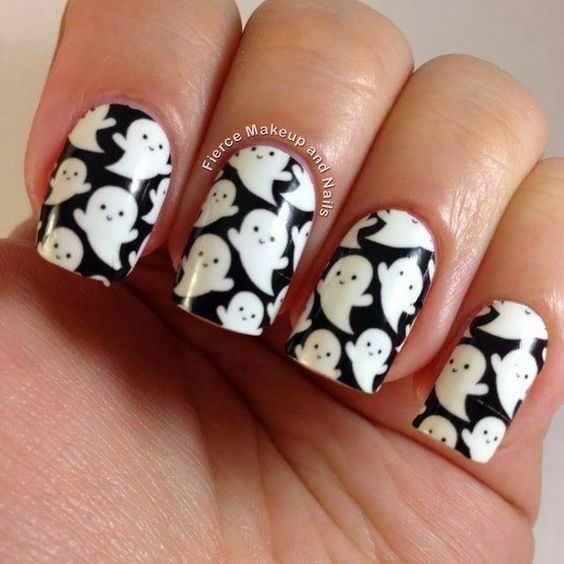 For Halloween we can choose a nail decoration that can be related to a scary costume: blood, drawings that represent all sorts of ghosts, vampires and even pumpkins. Elements that are characteristic of a holiday such as this one. 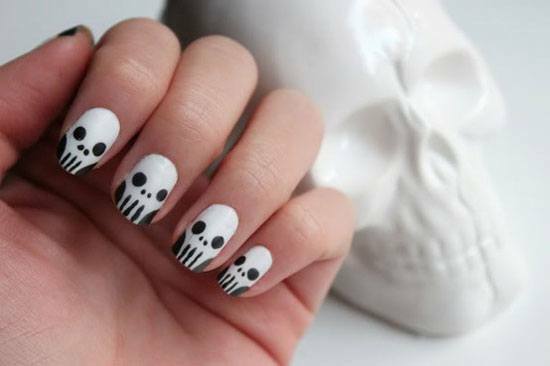 Maybe this type of nail decoration, such as Christmas nails, seems a little complicated but the truth is that as long as you are patient you can learn to make all kinds of drawings such as skulls, spiders or whatever you want. 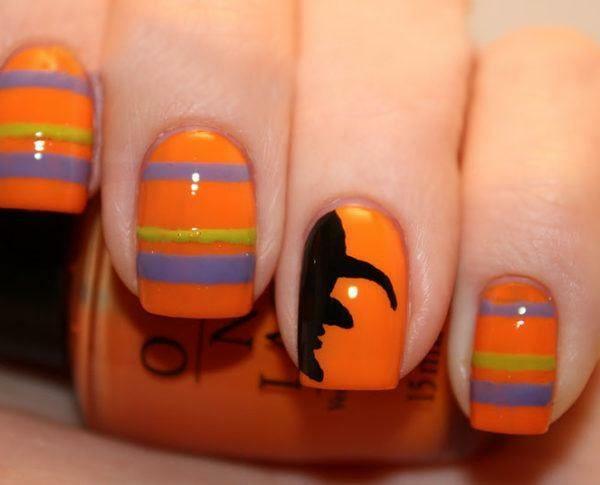 In addition Halloween is well-known because of colors such as orange or black. These colors can be the ultimate basis for decorating your nails as we see in the photo above, with a simple but very appropriate design. This holiday it is also known for it’s famous pumpkins. Wouldn’t it be great to have your nails look like something of the sort? 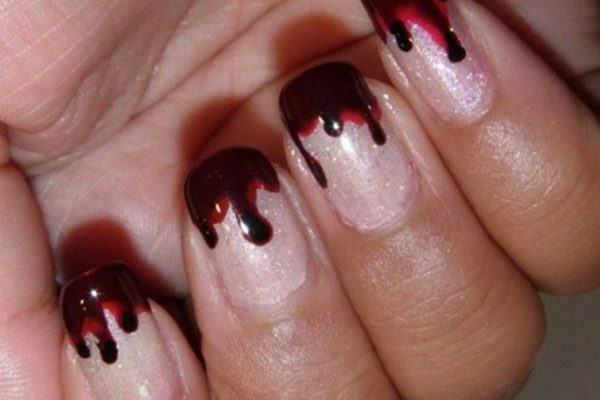 We are going to give you some ideas that will undoubtedly allow you to wear decorated nails for Halloween 2018 that will complete the vampire costume that you are thinking of wearing just so you can scare everyone. 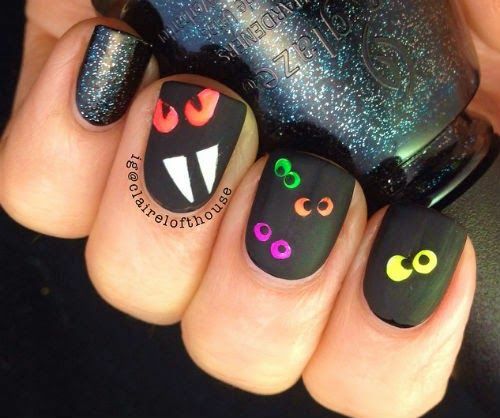 Halloween nails 2018: Easy peasy! 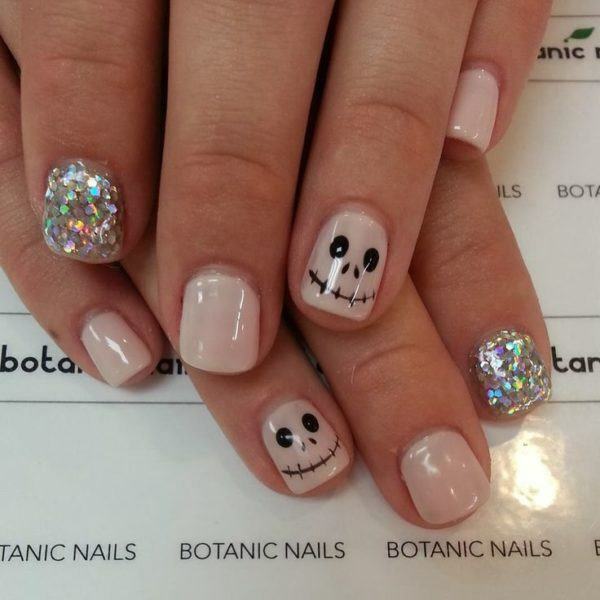 It is not necessary to wear a very complicated and elaborate nail design to have the perfect look for a Halloween party. 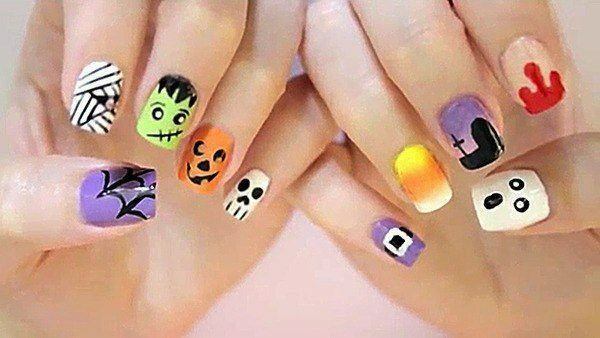 As soon as we’ve decided on what costume to wear, the only thing we have to think about is choosing the nail design that will please us the most. 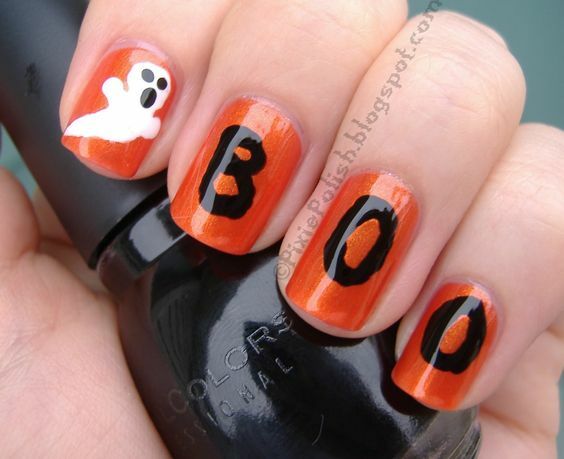 Up next, we will show you the best nails for halloween that are easy to paint. Bear in mind that we have to be patient so we can carry out the perfect nail design, with a white background and a little black to give shape we want to achieve. We can also wear our nails all covered in white except for one of them that will have some black in it to make it stand out more. As we have seen in the photo above, the rosaries are now fashionable. 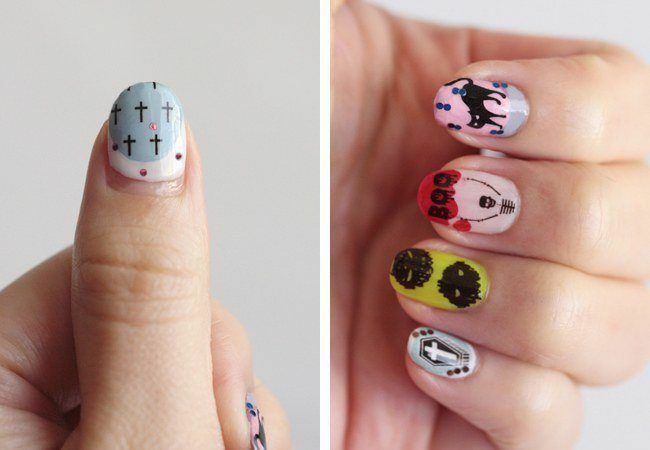 A decorated nail can be a great idea that will lead to beutiful results. 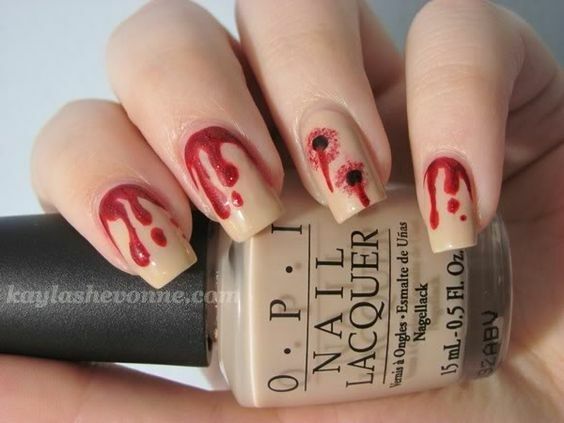 A very requested design is the one of bleeding nails. 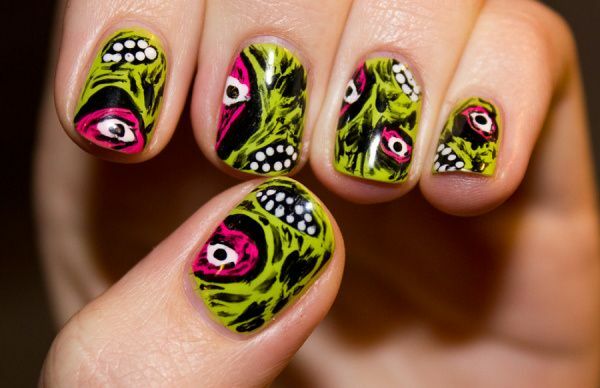 This nails have an original style and the design is really easy to make. On a white base with certain pink tones we will have to paint red drops as if they were blood. But to paint the drops you have to wait until the white base is fully dry. 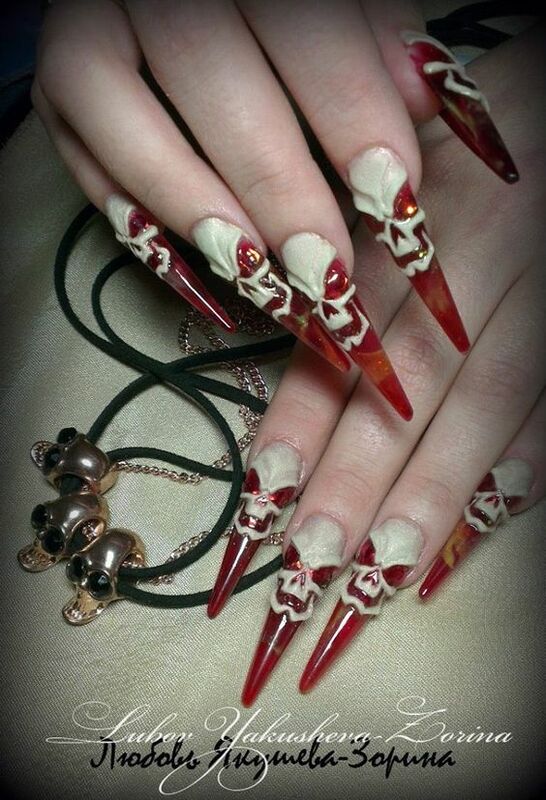 If you do not want drops of blood you can put “shots” on the nails. That is, holes like those shown in the following picture. Now we show you the most beautiful designs so that you can choose the one you like and match the nail design with the costume you will be wearing. The design that appears in the photo is elegant and beautiful. 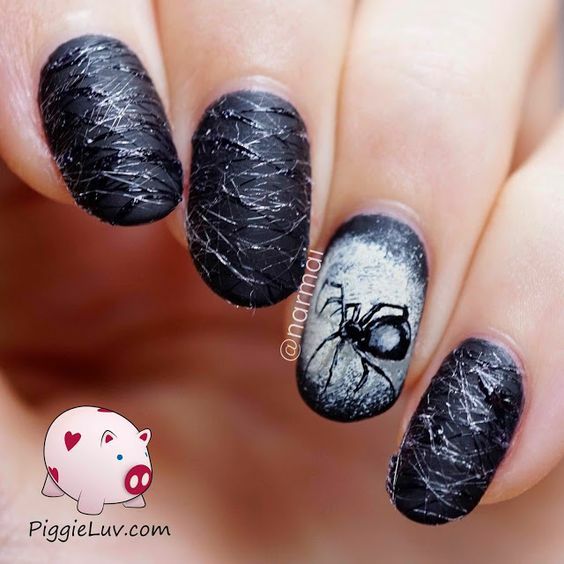 The nail is mainly black and it also has effects of cobwebs and, in one of the nails, there is a spider on a grayish background. 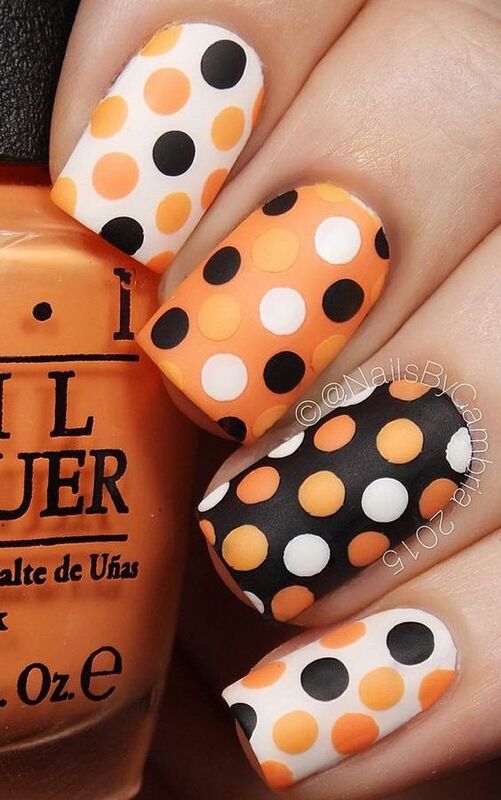 If you want more vivid colors and also the most characteristic colors of Halloween this is your style, with the classics: orange and black. 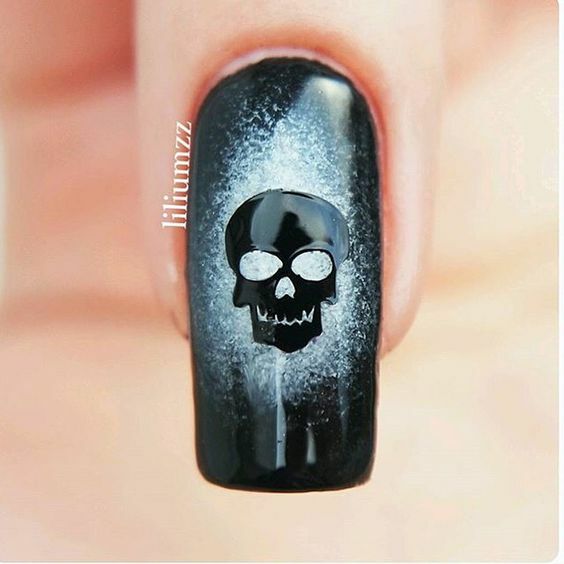 The skulls are very typical and everyone wants to wear them at a Halloween party, which means this design never fails to impress. In addition, there are many different styles and designs. But if you want to be more original you can wear the Mexican skulls, although it is more difficult to paint than the classic skulls. 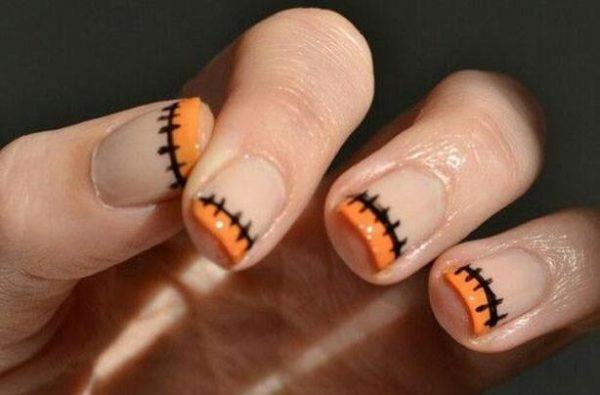 For the most daring and original people we recommend that you choose this design: halloween claws. In this section you will discover the best ideas ever. 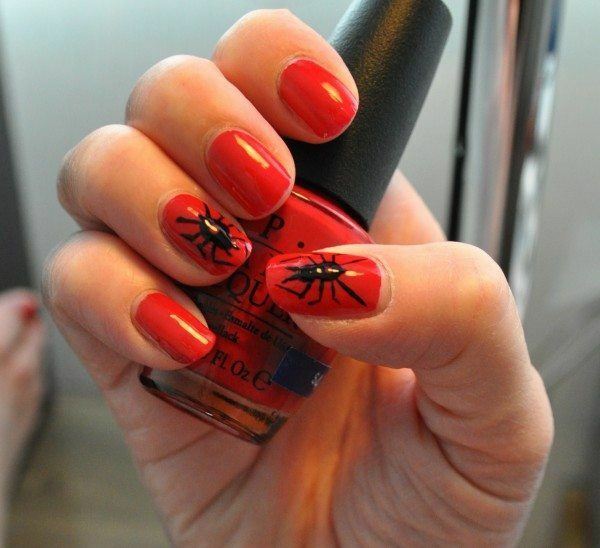 There are many possibilities when we want to wear beautiful claws at a Halloween party. We can choose between a more classic style or a more daring one, like we seen in the next picture with stickers and glossy. 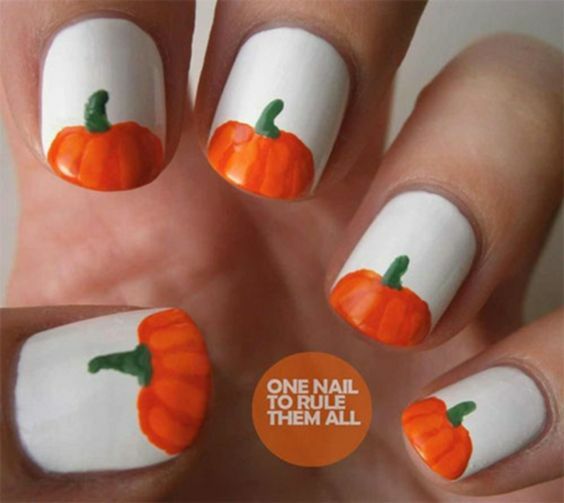 To decorate your nails with pumpkins you can be truly original. There are many different designs but what usually doesn’t change is the fact that we still use classic colors: orange and black. As you see, just because we want a pumpkin design does not mean it has to be the same designs, they can differ a lot. It is important to have a good pulse to paint the triangles well, so we recommend that you use a thin brush. Talking about halloween and not naming skeletons is not possible. 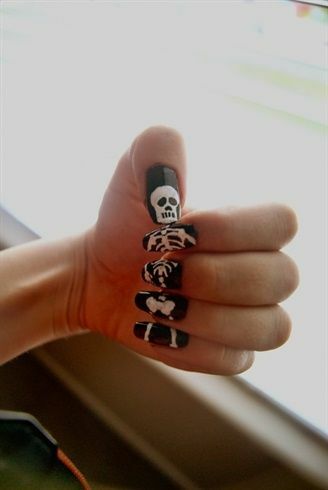 We are going to show you a great range of possibilities of nail designs of skeletons in different colors. Don’t think that black and white is our only option. 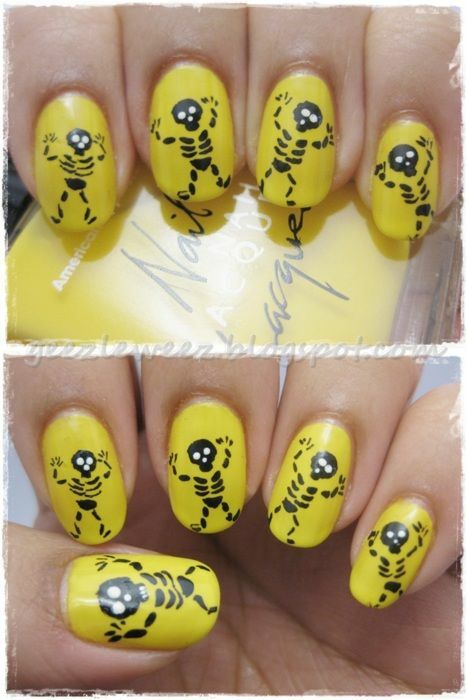 You can wear a fun design, with skeletons dancing on a yellow background and with white eyes. They do not have to be the same as the ones we see in the picture… Be creative! 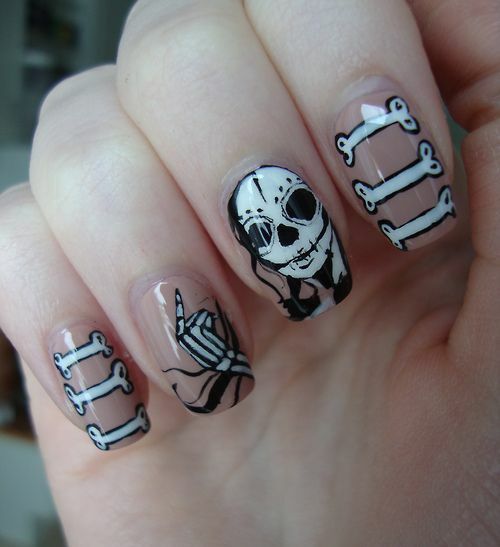 You can also create a different style of skeleton for each nail. Imagination is very important in nail design. What do you think of this style? Do you like it? 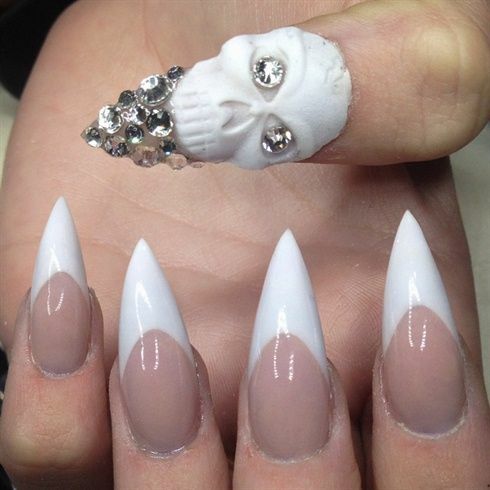 If you decide to go as a witch you also have to up your game when it comes to the nails. We can teach you many styles, each and every one of them truly original and with different colors. The vivid colors are fashionable and the latest trend is to make the nails match the color of the socks you wear, even base the nail design on those socks. But if what you truly desire is to be a modern witch and you want the brightest colors these nail designs are just for you. Only using black polish with some shades in purple or green is old news: now we dare with the weirdest combinations of colors. 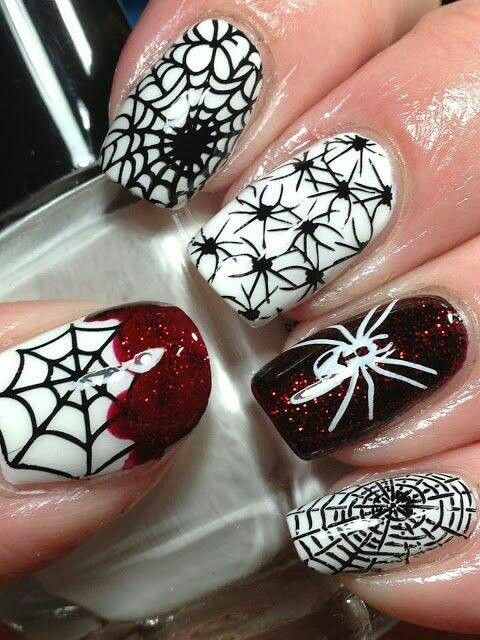 Spider webs are a very typical design that people tend to like quite a lot. The only thing is that you should have a good pulse. In order to be able to paint the cobwebs, it is necessary that you have a thin brush. 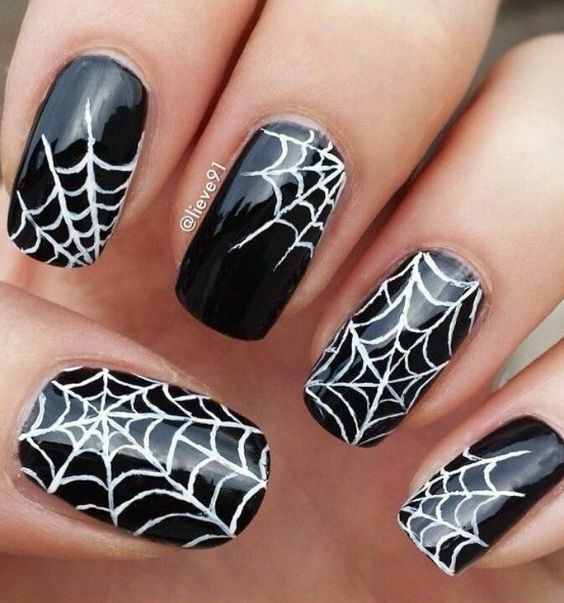 Usually on a black background we can draw spider webs. These can be painted in white, but you can also use other colors. Although the blood has an important role as well, in the following image you will see spiders and webs covered in blood. This is one of the latests trends for this upcoming Halloween 2018. 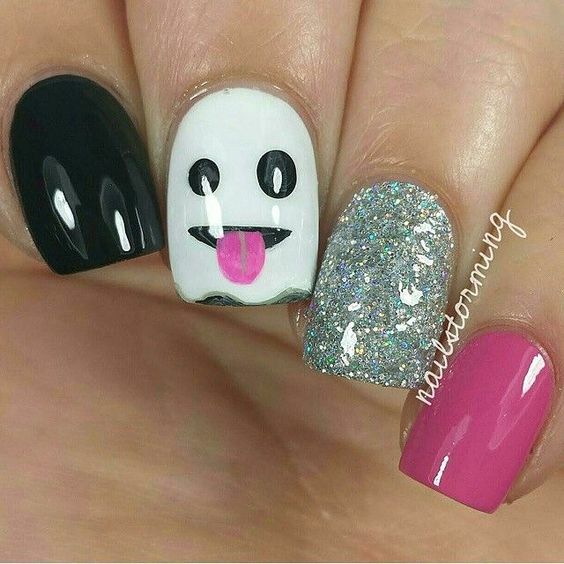 For the funniest people around we recommend that you wear nails with ghosts, but not the typical ones but the original ones: ghosts with vivid colors or with funny shapes and words. You don’t have to choose the typical white ghosts on a black background desgin. We can use colors to match our costume like the one we see in the following image. We always try to take into account the latest trends and we try to use our imagination. This is how we came up with the idea of putting words, not very long ones, in the nails. 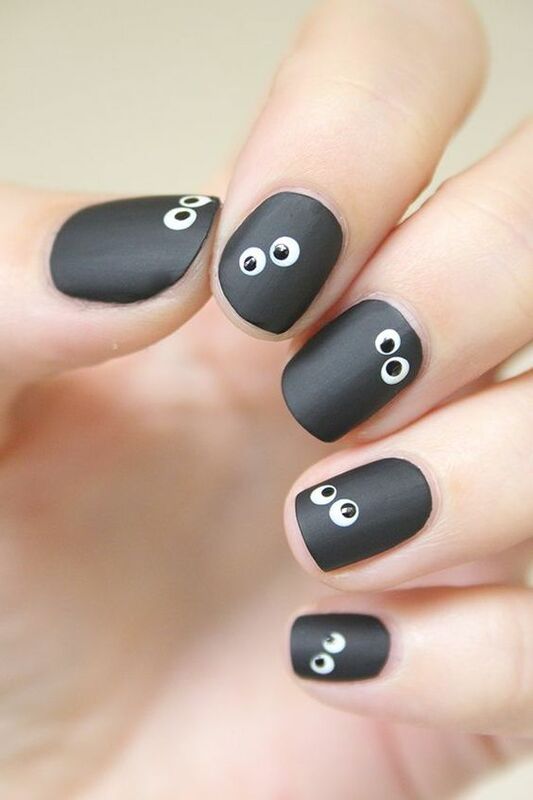 An easy style for our nails is to draw eyes on them. This makes people feel that they are alive, as you can see in the following image. We can also draw monster eyes, usually in green to make them more terrifying. 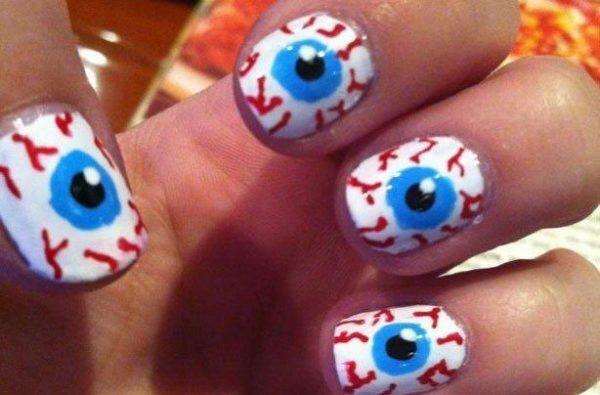 Or the classic normal eyes but each one in one corner of the nail. The key idea is that they are all over the place. Same as we paint our fingernails, our toenails are also important. Let’s see the latest trends in toenail design. You can also wear the same sesign in both hands and feet but in a different order so it is not too monotonous. You can choose where to draw each design as long as it is not in the same order. 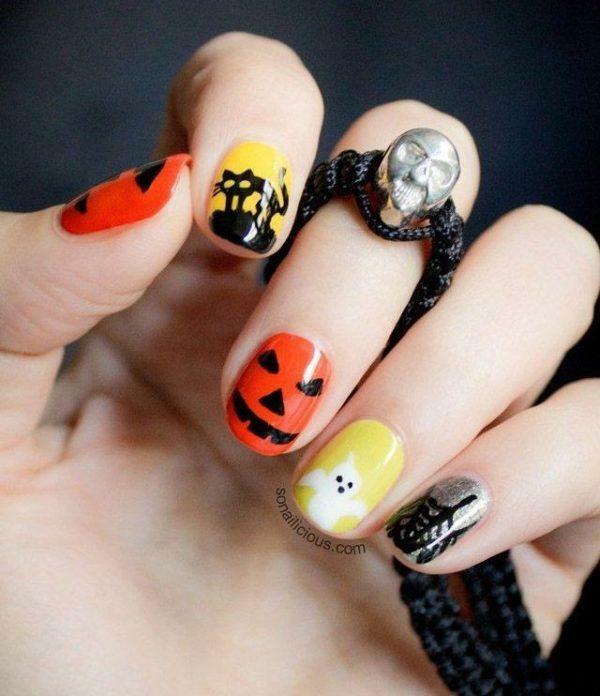 Regardless of whether we are going to put a costume on or not, wearing nails decorated with a Halloween style is a way to be spontaneous and fun. Why not add a terrifying touch to such a special and unique day of the year. 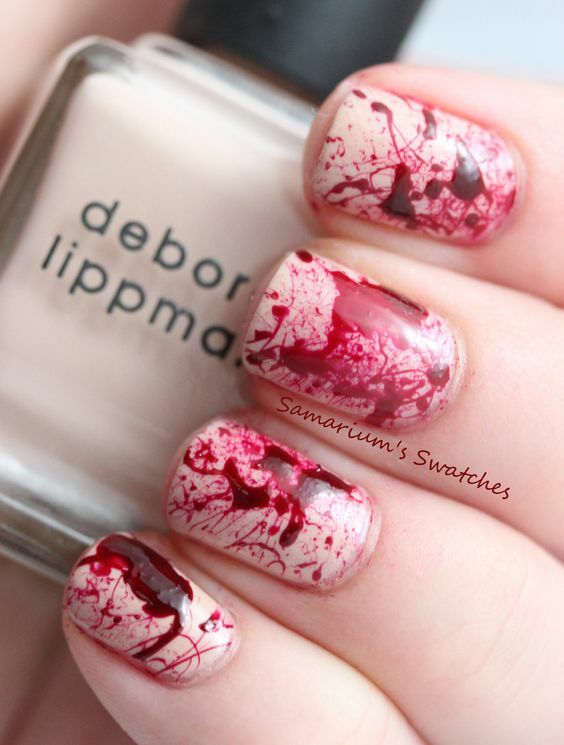 We will now show you how to create an effect as if the nails were stained with blood. In order to do this we have to start painting with a bright and light nail polish and then create the effect with another red nail polish that we will only apply to the tip. 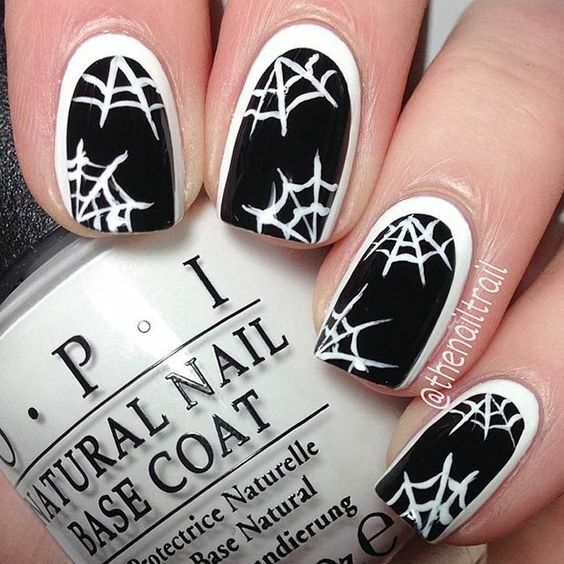 The truth is that there is a wide range of nail decorations for Halloween 2018. 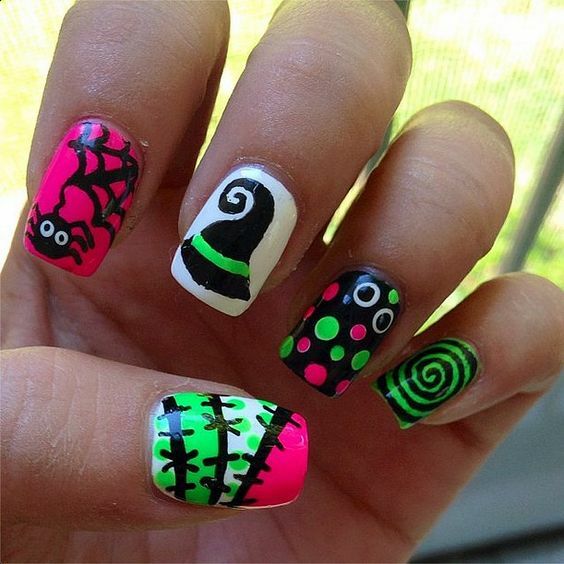 This is why you can choose nail decorations that feature the so traditional pumpkins for all those who worship Halloween, and also nails decorated with more abstract drawings that convey the spooky and terrifying side of this holiday, as you can see above with decorated nails on a green background. Ghosts and skulls are Halloween classics, perfect to match our look, regardless of the costume chosen. One advantage of this design is that it is based on two colors as basic as white and black. No doubt this can inspire you and can be used in many designs. 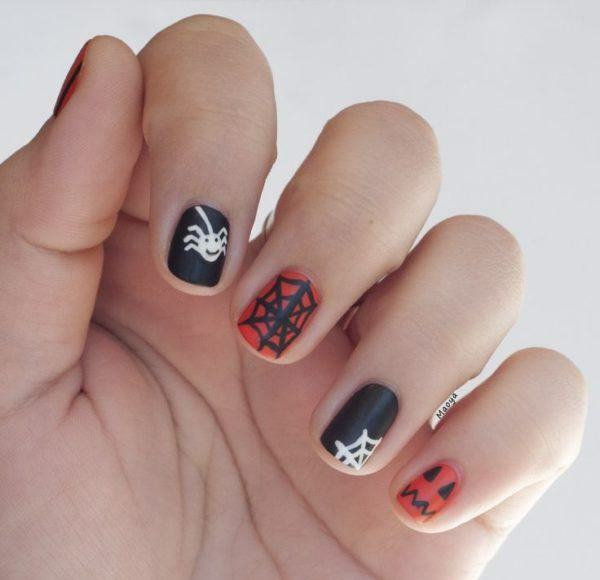 Although nail decorations are often fun, we can also choose the most terrifying nail decorations and costumes and makeup so we can be really scary. 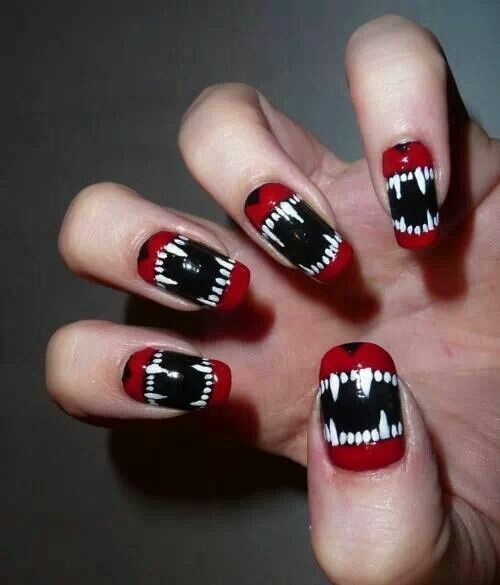 For these bloody nails, monsters or fangs are perfect choices. You can also choose to draw some eyes, which in short is not that very complicated to do. You have to paint the nails in white, then paint two circles in the center, one in blue and one in black. Finally a few lines of red are added to resemble a little blood. By using a thin brush you can make red lines and, first and foremost, let the nails dry with the base in white and then make blue and black circumferences. A type of decoration that we like a lot is the one that “experiments” with different colors. I have already said that black and orange are two of the colors that are mostly used for Halloween. In spite of how many proposals based precisely on these colors we may see, we wanted to show you nice different nail decorations. 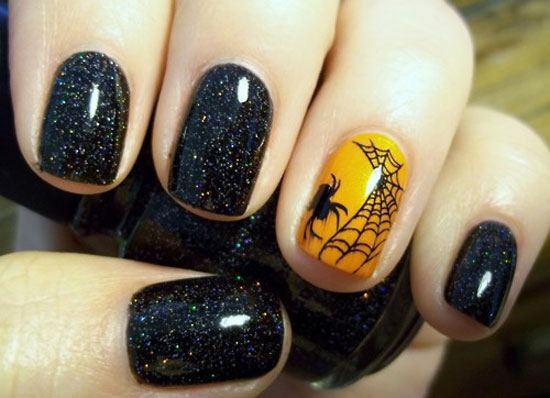 It is as simple as painting your nails in black, you can apply the “glitter” or not, your choice, and you leave one nail to paint in orange and also draw a small spider web with the spider included if you want. 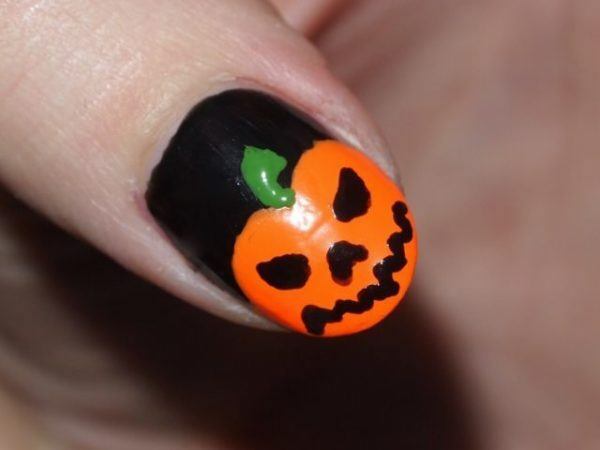 As we’ve already mentioned before, when it comes to choosing shades, there are certain colors that we will see more often next Halloween on everyones nails. 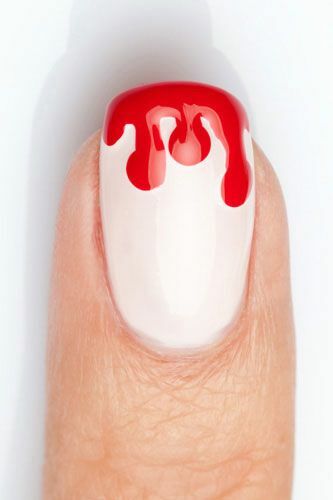 Black, white, red and orange are ideal to decorate our nails and to achieve the perfect design for the Halloween party. If you realize it, with three or four colors we can make lots of decorations and that may even inspire us when it comes to choose a costume later. The mixture of these colors, either in drawings or while mixing styles, is the perfect combination to get our nail decorations to stand out on our costume, and of course, on our hands. Look at these nails in which three shades have been chosen: black, red and white. 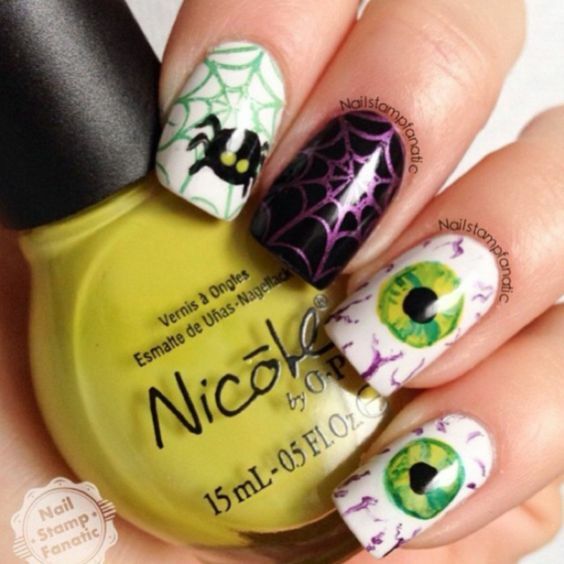 With these three colors we have been able to decorate our nails with different drawings, such as a spider, a pumpkin and, of course, a pair of spider webs that at the same time are from the spider different. 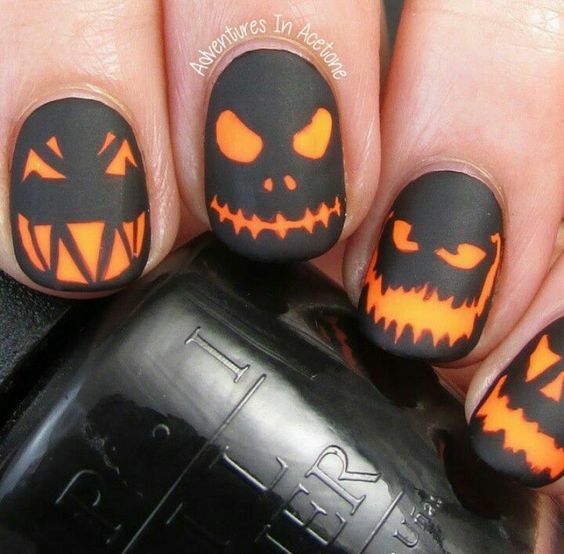 There’s also room for softer colors and the brighter ones in the Halloween 2018 nail decoration as these are trending this season. 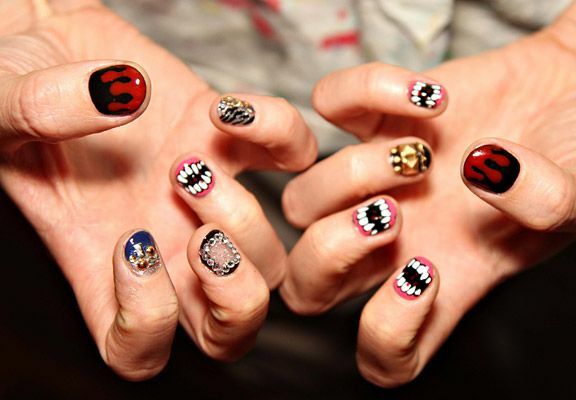 Not everything has to be necessarily dark colors or sinister decorations: the mixture of glamor and terror can also come in handy in order to get a perfect manicure. 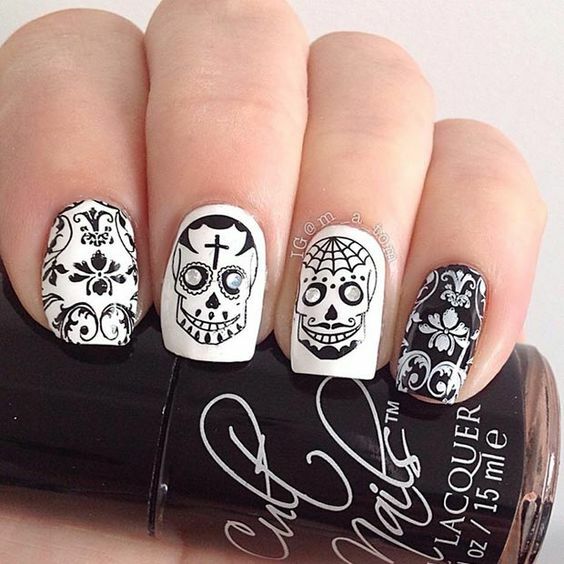 The black and white combination also suggests that also lead to us decorating our nails with skulls, quite popular during Halloween. 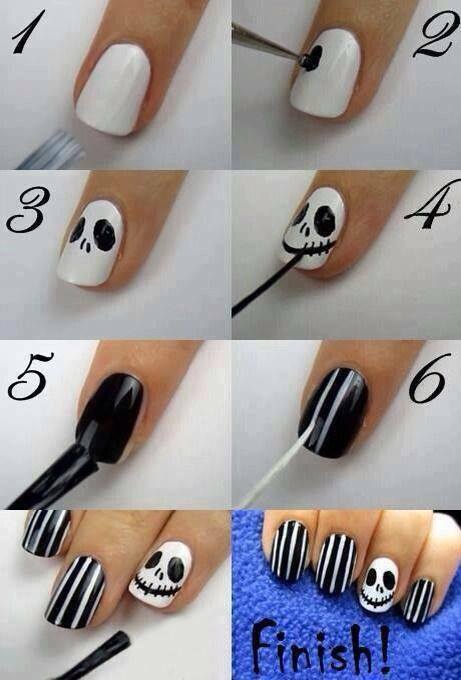 Try to paint your nails black and, with the help of a brush, shape it by decorating the nail drawing the skull. Leave the rest of the nail in black. Or you can paint the base in black and make the drawing of the skull on top of it.